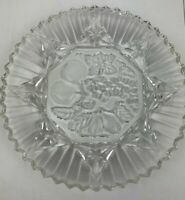 Vintage England Cut Glass Crystal Small Handled Dish Jewelry Vanity Tray 7¼"
Vintage cut crystal candy dish /lid footed antique mint heavy large estate sale! 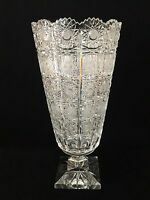 Monumental 16" Lead Crystal Fan Cut Saw Tooth Pedestal Vase, Extraordinary! Tall American Brilliant Cut Glass Vase w/ Sterling Silver Rim ABCG ~ 13 1/4"